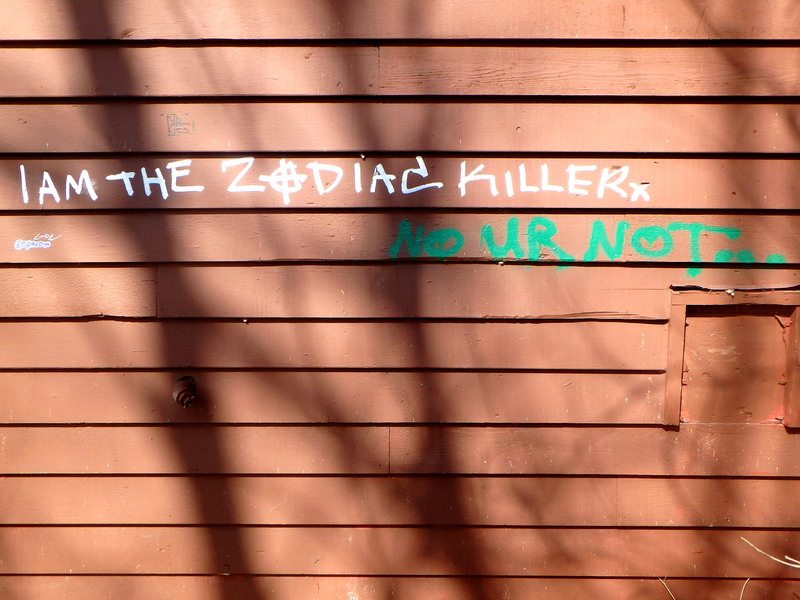 My new motto as of late has been out with the new and in with the old. 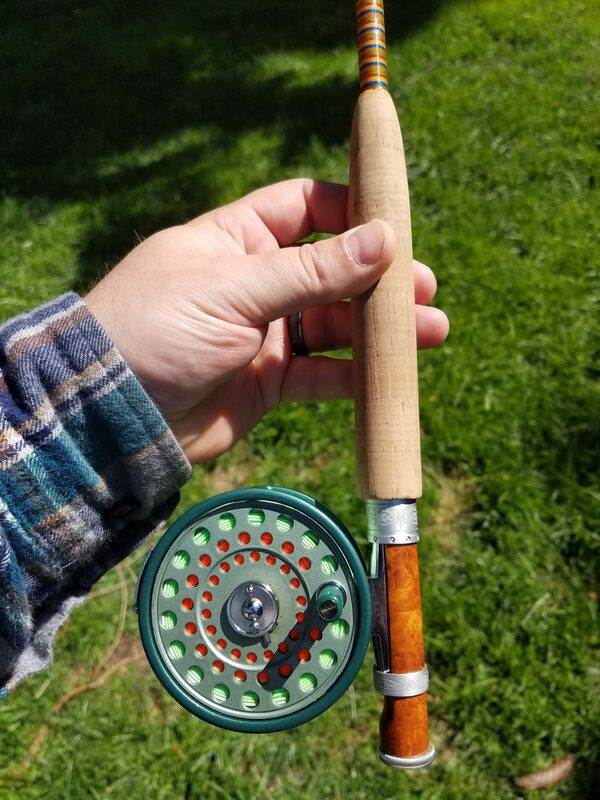 After building my first fly rod which was a 7′ 3/4 wt fiberglass, I decided I wanted an older reel to pair with it. 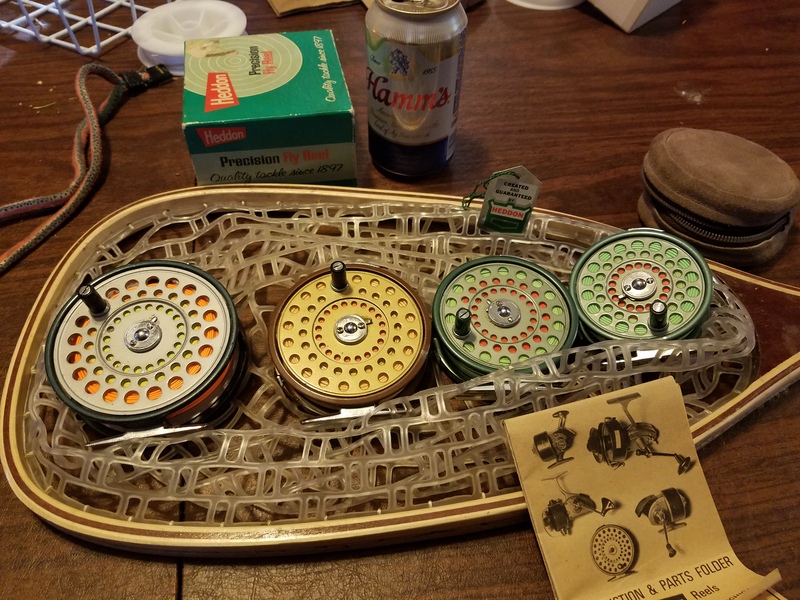 Little did I know I was about to enter a whole new addictive realm of fly fishing…antique reels. I’m not even going to think about old fiberglass and bamboo rods at the moment for fear that my head might explode, and I end up broke. 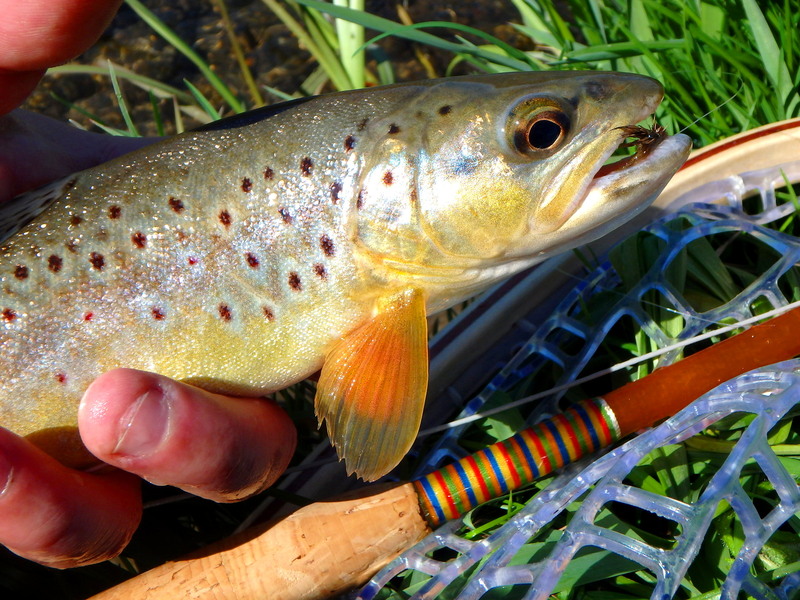 I think as fly fisherman grow, an appreciation for the tools used before our time to catch fish develops. There is an appreciation of history and tradition running through our blood, and over time, we are suddenly able to tap into it. The simplicity and functionality of older reels has been proven over the years. 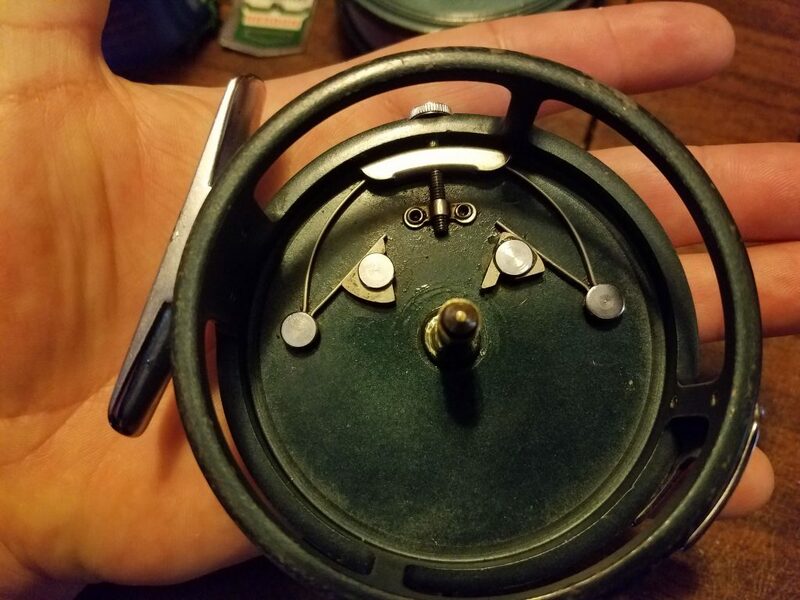 With a little TLC, and proper application of the reel, and old click and pawl can last around 100 years and maybe only need a new pawl and spring somewhere along the way. 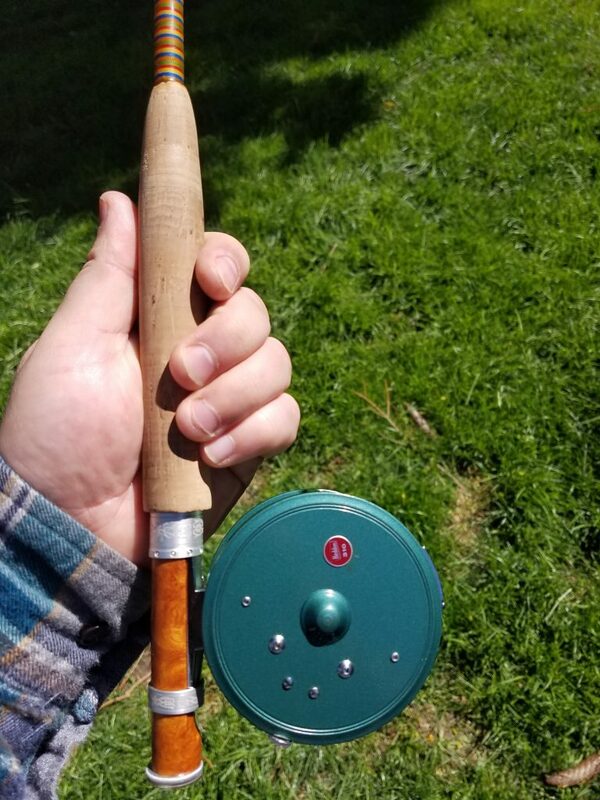 There is just something spectacularl about using an old reel that caught fish for many years…and then using it yourself…adding to that history…and knowing when you die, that same reel isn’t done creating history and catching fish. Whoa…that got deep. Another feature of the clones I really liked was the ability to interchange Hardy parts and spools (to an extent), as well as other clone parts of the same size (to an extent). Many clones had multiple manufacturing runs and some spindle sizes and latches etc just don’t interchange. You can obtain Hardy pawls and springs if needed through Pure Fishing, and they will also optimize the performance of a clone. I read the drag is much smoother and they “purr like a kitten”. I think I will try putting hardy pawls and springs in one of my LRH clones and see what the fuss is about. After playing around with my Heddons, Daiwas, and Eagle Claw clones, I know I quite enjoy the amount of click volume I get from them and they are smooth enough. 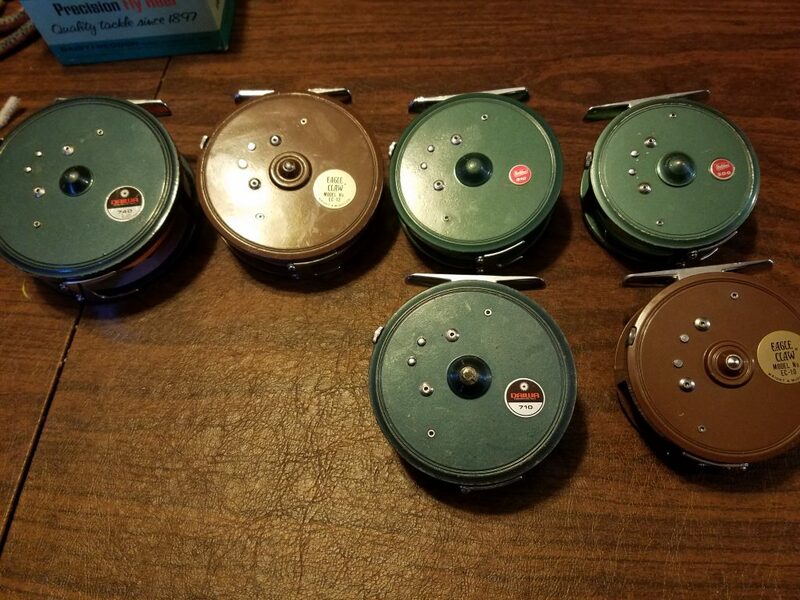 I like to think these old click & pawl reels help keep the bears away if you’re fishing in the wilderness or maybe keep the cows at bay in the Driftless area. Another nifty feature of these reels is the ability to easily change the retrieve from RHW to LHW. It’s just a matter of disengaging one pawl and engaging the other. Also, if you wear one side out just flip the parts around and you should be good to go. Pawl orientation for LHW. For RHW, simply disengage the one on the right and engage the one on the left. The Hardy Lightweight Series includes the following models: Flyweight (2 1/2″), Featherweight (2 7/8″), LRH (3 1/8″), Princess (3 1/2″), and St. Aidan (3 7/8″). My recent experience on the auction site has been that depending on condition, you should be able to get a pretty solid clone with minor wear for around $50 if you’re patient. A clone in near mint should fetch around $75. Mint clones with original box and papers can go for around $100. Kinda crazy considering these reels were priced between $5 – $12 back in the day, and it’s even more crazy a mint hardy clone today is fetching the same price as a new Hardy years ago. Here is a list of Hardy Clones I’ve come across. This is by no means a complete list but it accounts for the vast majority I’ve seen: Heddon/Roddy [UK Mfg] 300 series (300, 310, 320), Eagle Claw series (EC 10, EC 11, EC 12, EC 14), Berkley (530, 540, 550),Daiwa 700 Series (700, 710, 720, 740), Compac, Zebco Z56, Alford, and LL Bean Quest & Guide Series. Any fly reel that has the iconic 6 rivet spacing is likely a Hardy Clone. The Heddons are the most common by far and that’s just fine. They are well thought of and I love their signature “Heddon Green” color. They function just fine to boot, and I have two of them. 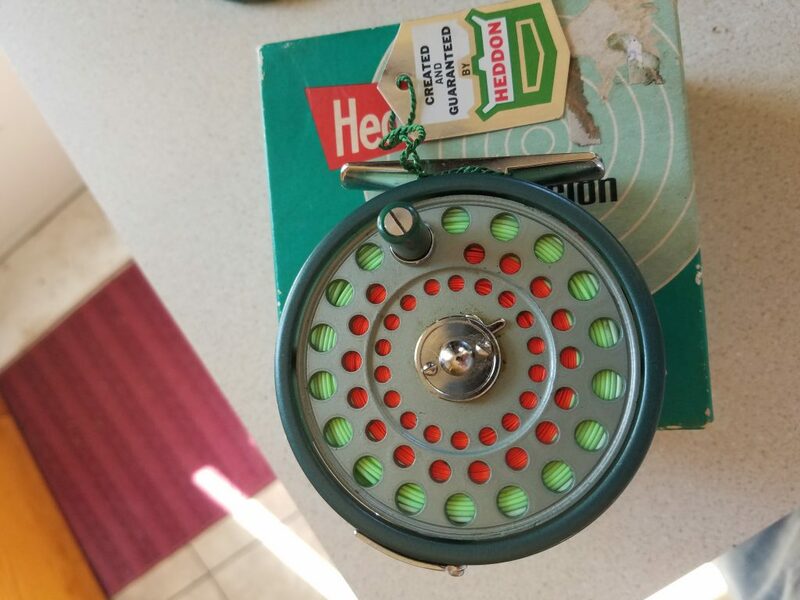 The earlier production runs of the Heddons can be identified by the stamp on the reel foot reading “assembled in USA”. They were likely first assembled in the USA to ease consumers minds about buying an Asian knock-off. 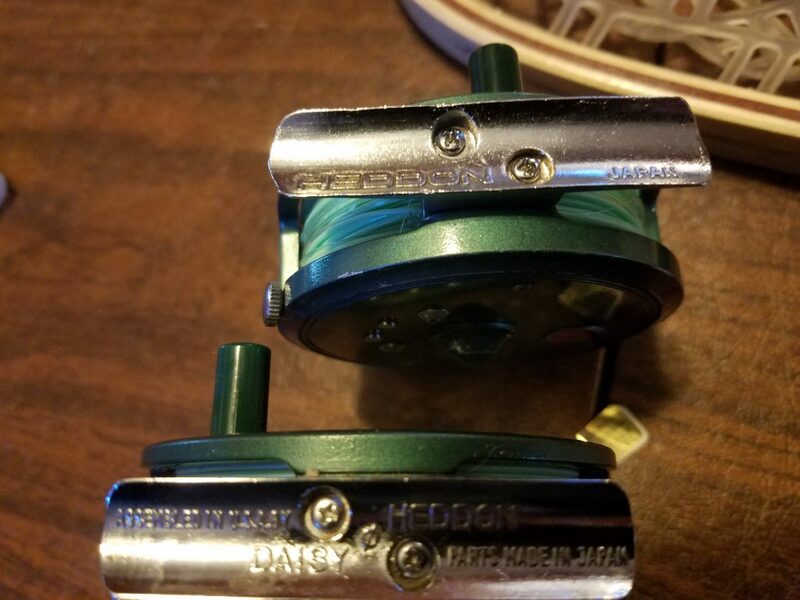 They were later manufactured and assembled in Japan and the reel foot simply reads, “Heddon – Japan.” I own both versions and like the earlier USA assembled one better, if for no other reason than the paint finish is a slightly brighter green and was assembled in the good old USA which likely had better quality checks. The functionality seemed about equal to me so the Japan assembly and quality checks were likely pretty good on these Heddons too or they got really good by the time my reel was made . Now I’ve handled 2 different Eagle Claw’s and one was noticeably superior to me and that would be the Japan reel foot stamped one. The EC’s were later manufactured in Taiwan and I found the springs to be of lesser quality (This reel seemed to have little wear so I don’t think the springs were worn) and the cog on the spool was of a lesser quality metal and the gear wasn’t stamped the same. The back-up spool also had a cracked cog and the cylinder looked to be cracking too. The idea of going from one Asian manufacturer to another instantly makes me think it was purely for cost cutting measures. So far I like the Daiwa 700 series best. There is very little rocking on the spool and I’m obsessed with the blue/green/grey color. Actually, the Daiwa 710 I own has no rocking whatsoever and the tension screw noticeably increases the drag. I also have a 740 paired with my 9′ 8wt Helios 2 and just love it. These Hardy Clones have a convoluted and rich history behind them which only adds to their interest. 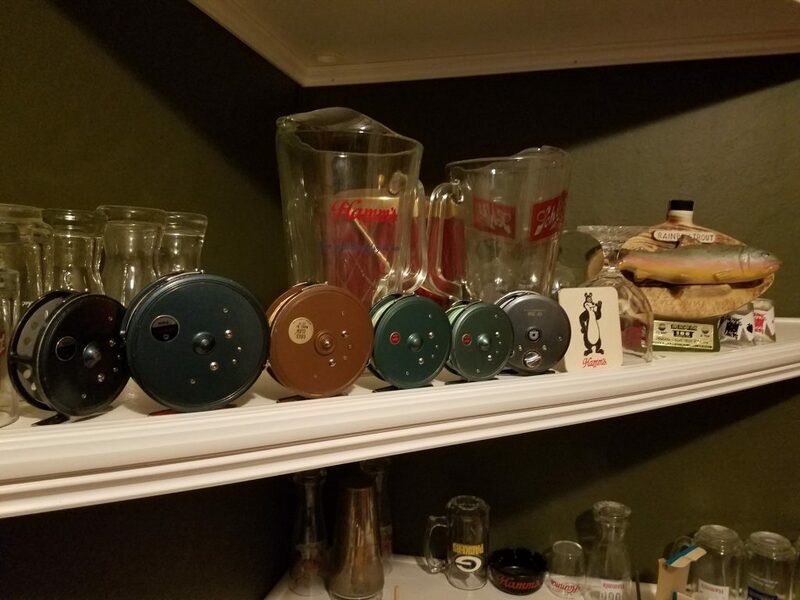 The Dude would say these reels have, “..You know…a lotta ins, lotta outs, lotta what-have-you’s…” Anyway, I really love these nifty reels and I highly recommend picking one up. 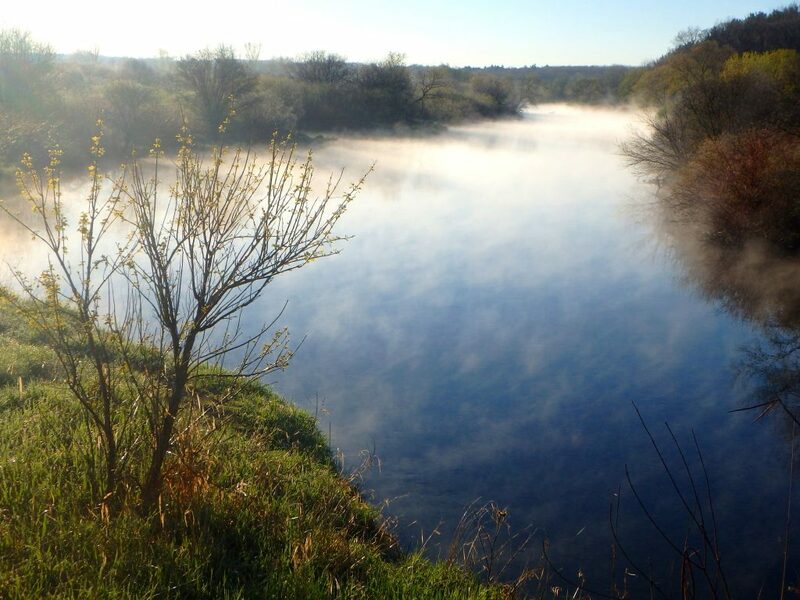 I was in no hurry to get on a trout stream in the early morning last Sunday. 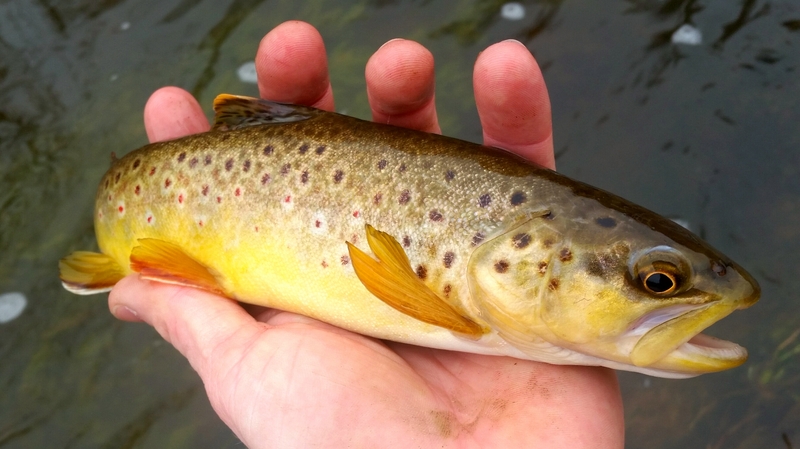 I was crossing foggy streams in the morning instead of arriving on one, but I was hoping for a good caddis hatch. My experience has been the fishing doesn’t start to get good until you feel the warm sun on your face and it’s gang busters if the hatch materializes. On this day, the hatch emerged around 11AM. 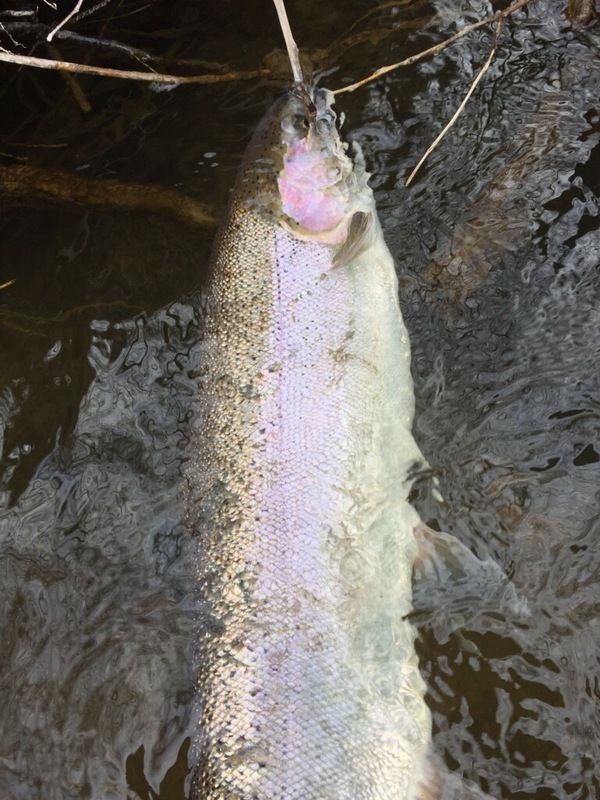 I tied on a simple olive ice dubbed caddis in size 16, and started putting up some serious numbers with my new 7′ 3wt fiberglass build. I can’t believe how long I went without a short fiberglass rod in the Driftless. I was able to make very accurate casts at short distances and was able to avoid low hanging obstacles that normally drive me mad. 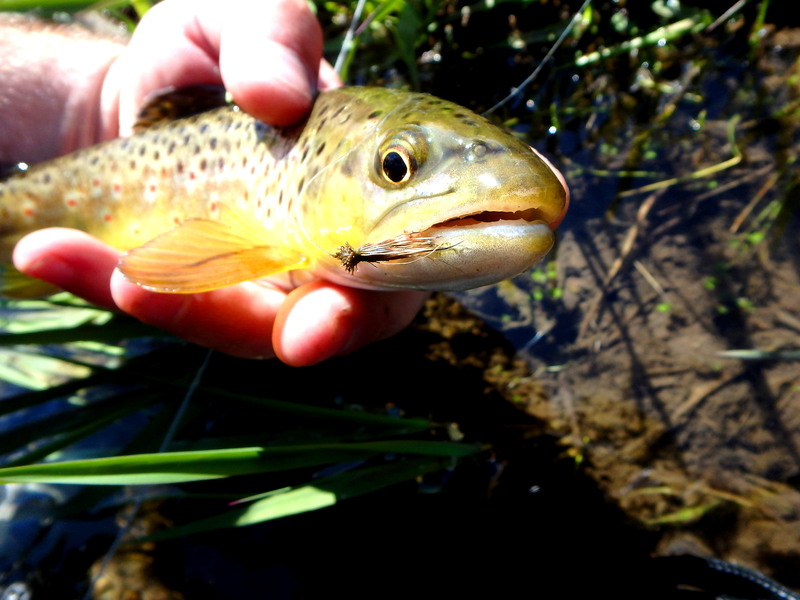 Not to mention even 6″ trout were putting a healthy bend in my rod. The fish were feeding at the heads of pools for the most part. In larger pools, there would also be fish rolling on nymphs in the middle of the pool, but I wasn’t really interested in them. 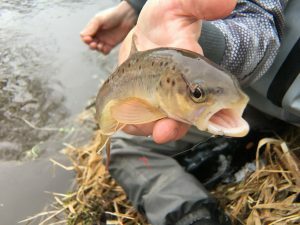 Just to prove a point to myself, I tied on a caddis nymph in one of these pools and landed a few trout for good measure on my 4wt. You really couldn’t lose. As I approached the end of the easement I was lucky enough to run into the land owner. We exchanged pleasantries and he gave me permission to keep fishing past the easement anytime I’m in the area. The day continued to unfold beautifully. 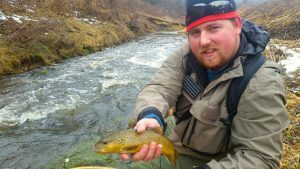 There were some really nice trout in the 18″ – 20″ in range on his land and the fish were even more eager. 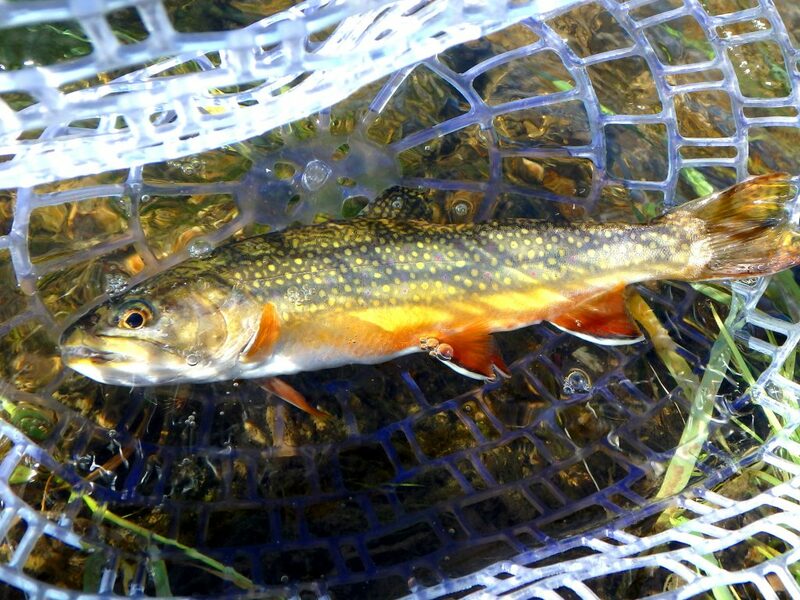 The icing on the proverbial cake was landing a beautiful brookie for my last fish of the day. I didn’t stop fishing until around 4:30PM and things were still happening when I stopped. 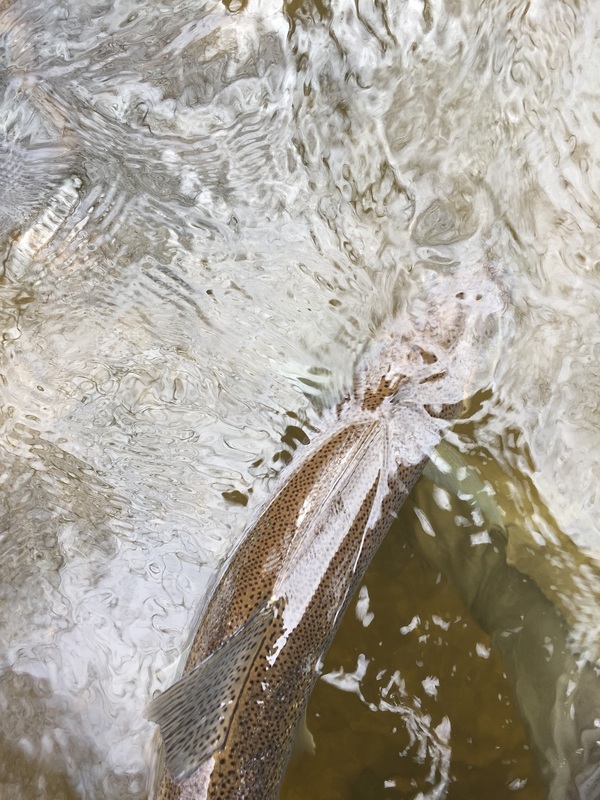 I had a banner day and put up around 40 trout and I probably caught the first 30 on the same fly before finally losing it. 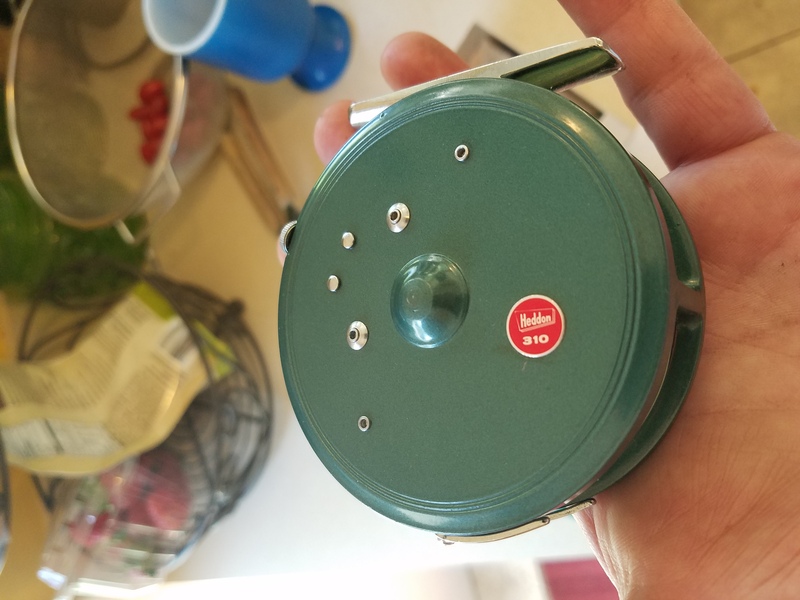 I lost it to the only large trout rise I had all day and my 5x was snapped before I even knew what happened. Probably should have had on 4x since I was dealing with eager fish. On the walk back I saw a few garter snakes as I walked the ditch, a hawk made a meal of what was probably a mouse, and a Tom Turkey crossed my path as I rounded the corner back to my car. 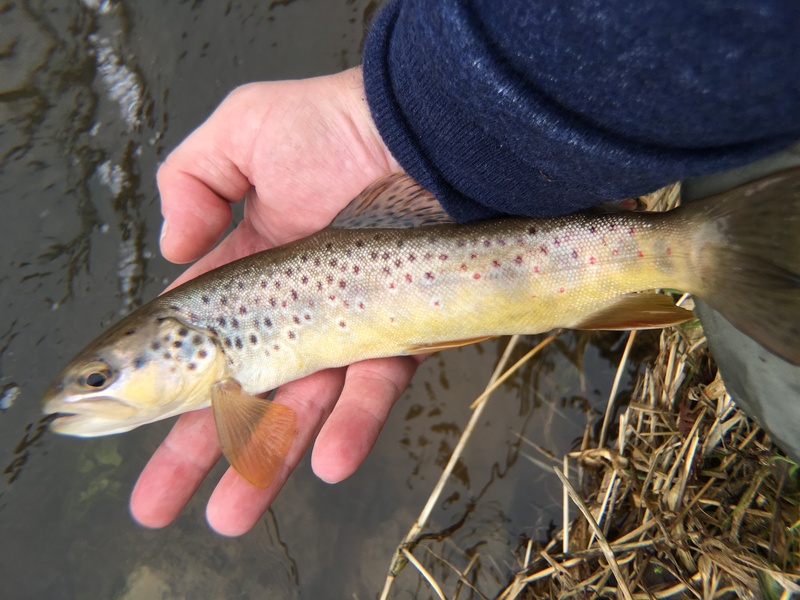 The Driftless did not stop delivering the most quality spring creek fishing experience from the moment I parked to the moment I left. It was a perfect day in the Driftless. Really nice to have some shady spots to cool down. My 7 footer made it possible to take fish from the head of this pool while in the shade. Hit the Milwaukee with Adam a few weeks back and we experienced something out of the ordinary…great fishing. 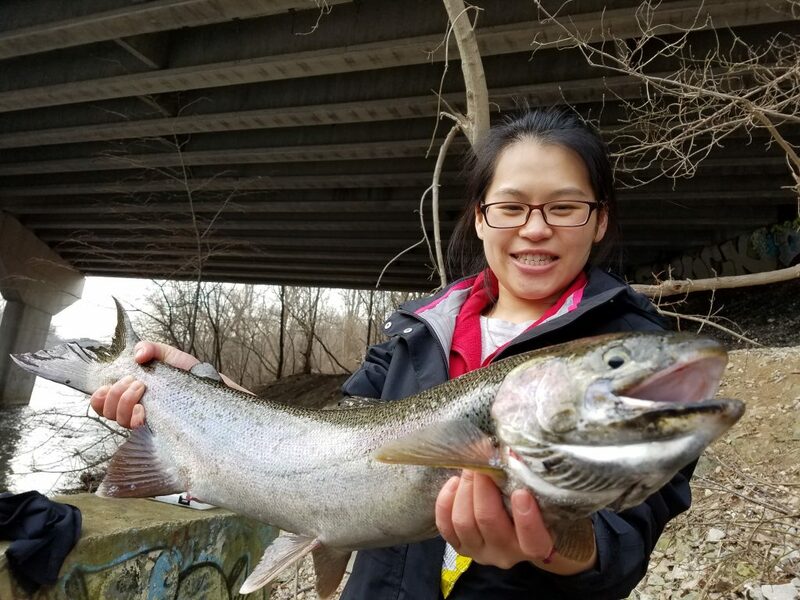 Even though the water was high, cold, and slowly rising all day from snow melt, the Steelhead were in and on the grab…bigly. Water clarity was great and very few anglers were on the water giving us plenty of room to work the runs. 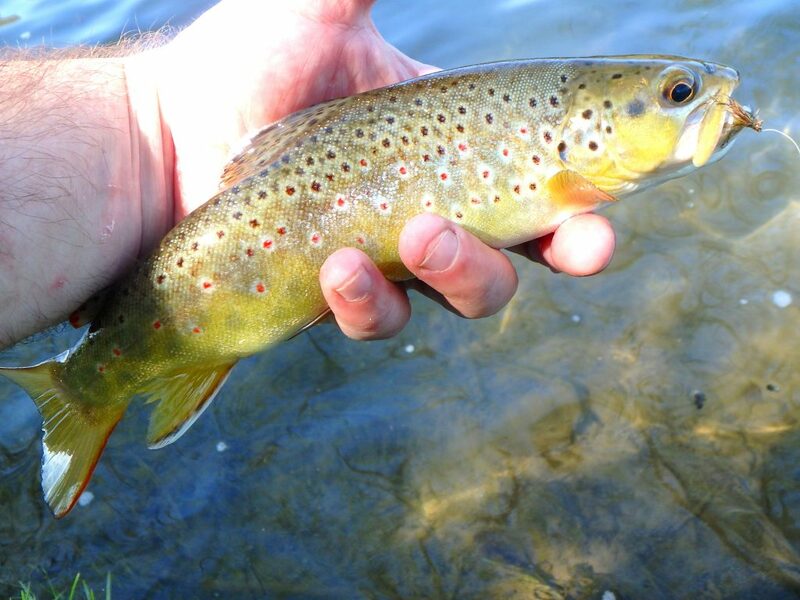 We were swinging large flies on full sinking tips and had about a dozen grabs throughout the day. 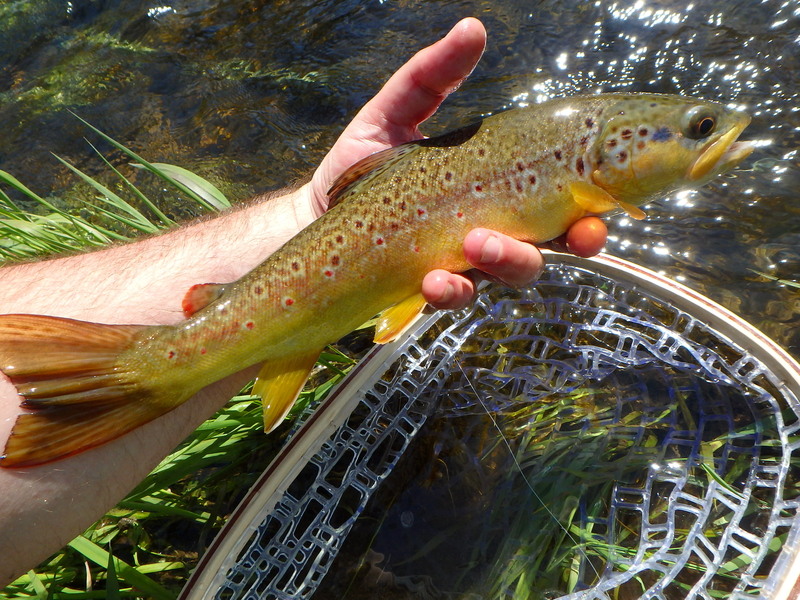 Adam was able to bring 2 fish to hand but we lost a lot of pinned fish…two of which were 30″ fish. 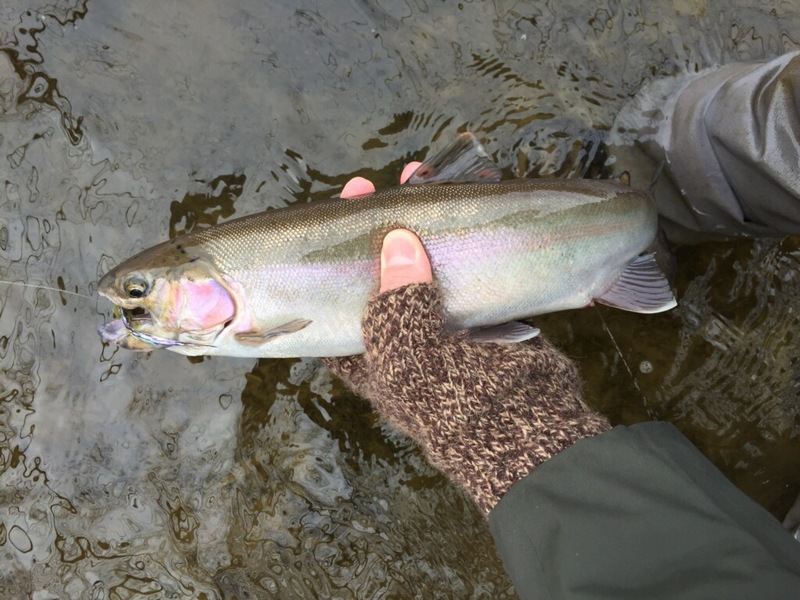 I was also spotting Steelhead in the runs and seeing the odd fish roll. 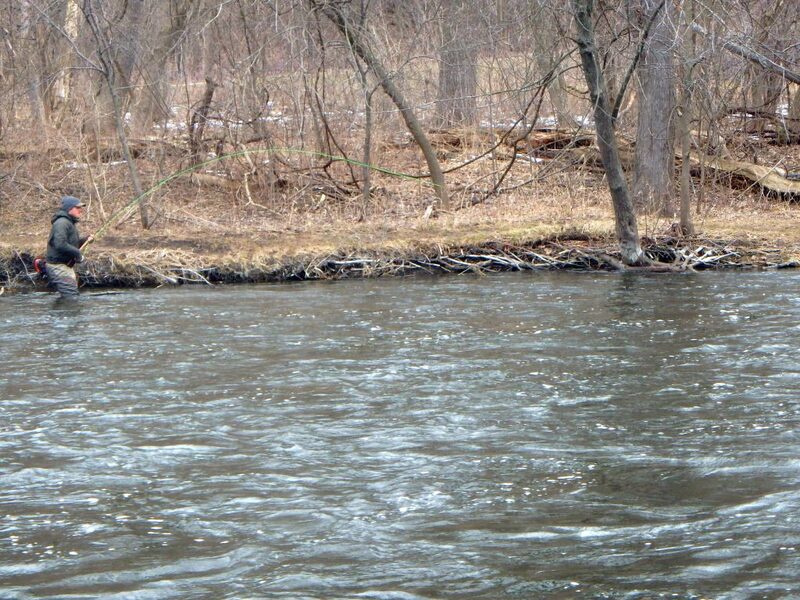 At the end of the day we talked to a DNR survey guy and heard some interesting news of great interest to Steelheaders. 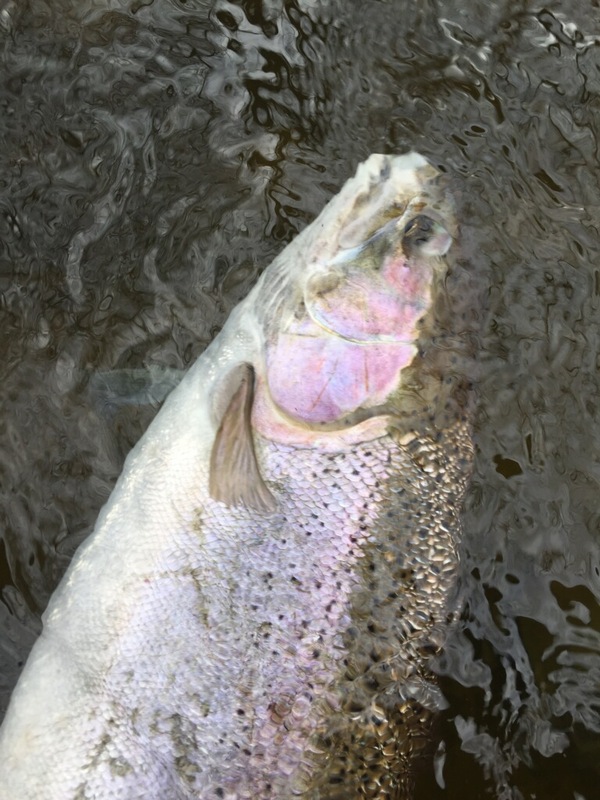 It seems the DNR is in the early stages or raising Skamania Steelhead out of the Kettle Moraine Unit and hopefully 4 or 5 years from now we will see our first Summer Run of fish. We have encountered Indiana strays before but it is a rare occurrence. Hopefully the Eastabrook Dam removal will be done by then too. 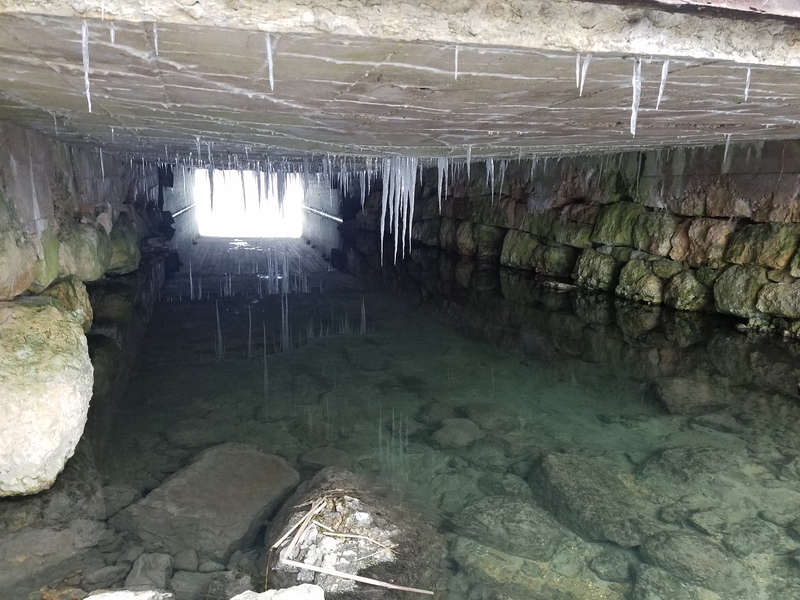 All we need is a fish ladder at Kletzsch and this fishery will really start to blossom. The DNR guy also said the stocking of German Browns will be discontinued due to lack of funding. Not sure if he just meant river stocking. The German strain are much prettier in my opinion and run earlier, but the Seeforellen reach spawning maturity later in life which makes them larger when you first encounter them in the river and they also tend to run later in the Fall. A few days later I took my newly wed friends Grant and Joan out to try and catch their first Steelhead. 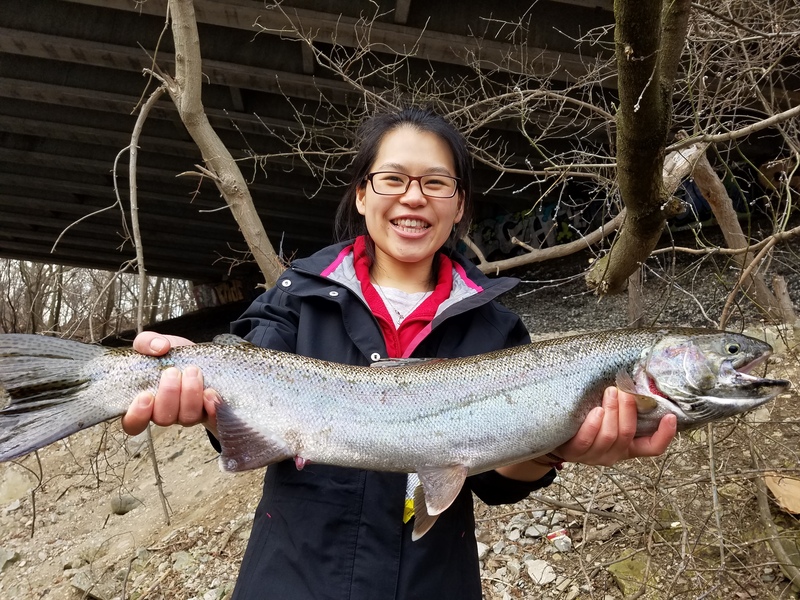 It didn’t take long for Joan to catch her first Steelhead on her first time out…go figure. She even got a nice leap and some up close and personal mayhem as the fresh Chromer splished and splashed. Rivers are high now with all the recent precipitation but when they come back down there should be more good fishing. A little late picking up on this story, but if you haven’t already heard the sad news, here it is. 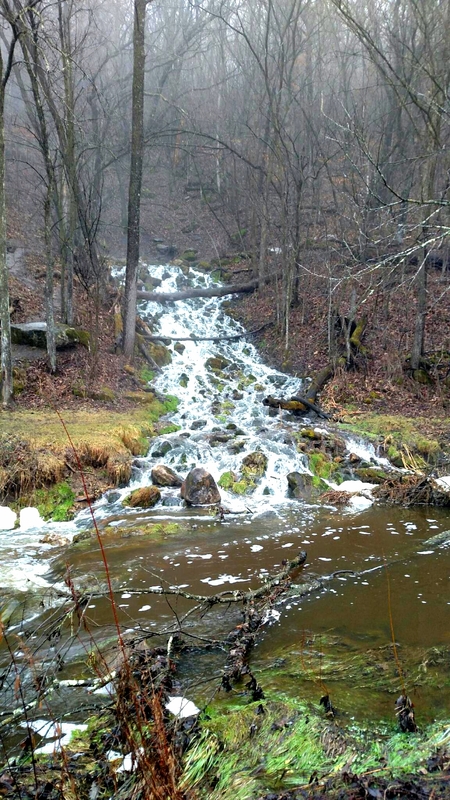 A dam failure June 20th, 2015 caused Paradise Springs in Eagle, WI to drain. Most trout escaped through a cracked hole in the dam and wound up in the creek flowing from it. Some probably even made it to the bigger class III stream further downstream. 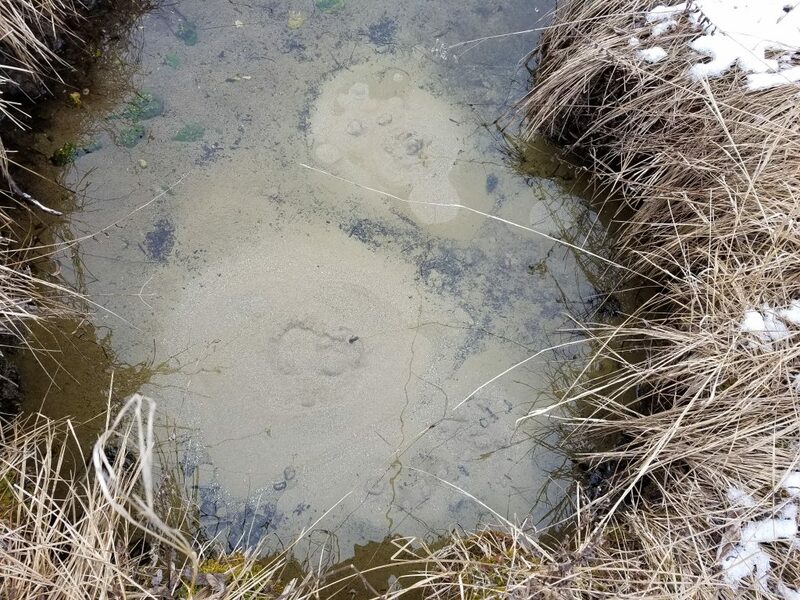 Some were trapped in shallow pools inside the pond. I was getting ready for a trip to PS this Saturday when I read the news. 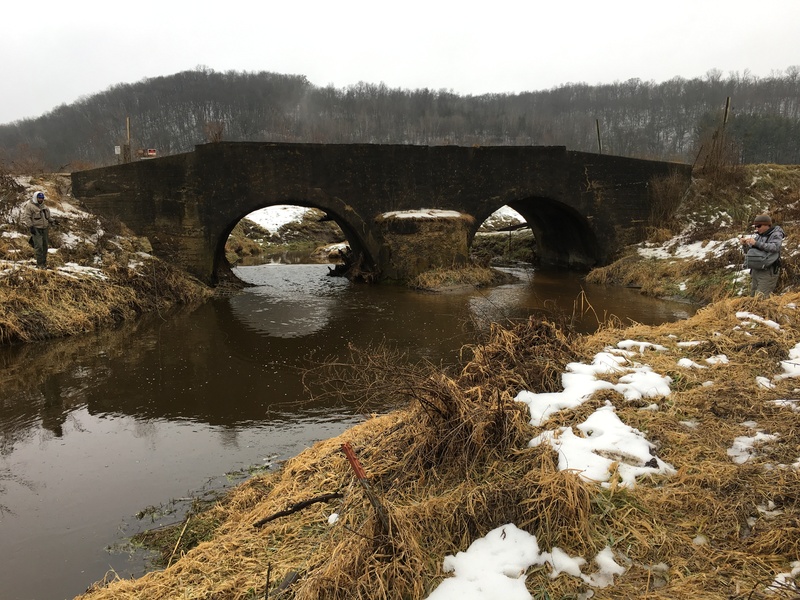 The dam reconstruction project will cost $300,000 and getting the funding hasn’t been easy. If you’ve ever cured your Winter Fishing Blues here and would like to again some day, why not donate a few bucks to the cause. This prompted me to try and find another Winter option near by when my clock is short. My expectations were incredibly low but my curiosity was soaring after doing some research. 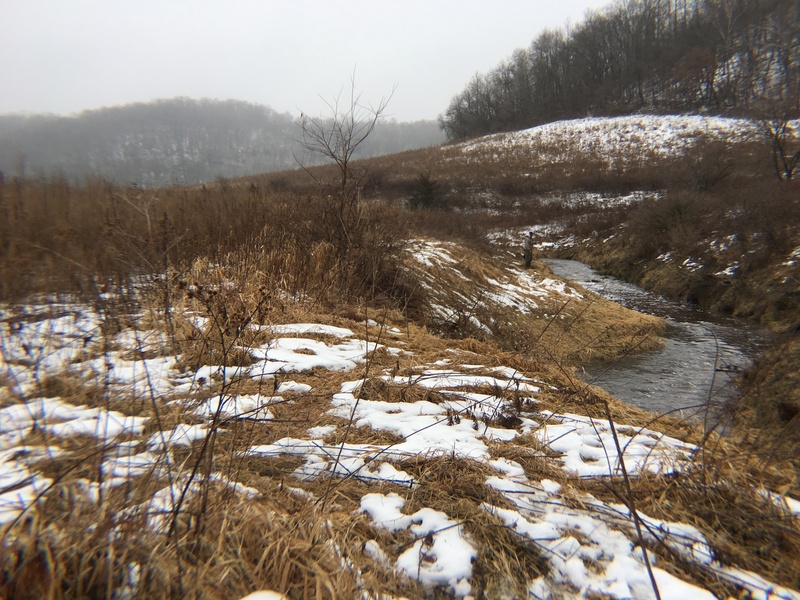 When I got within a few miles of the stream it started to feel like a miniature Driftless. Smaller winding hills with small valleys draining water. I arrived in the Afternoon and mainly hiked. 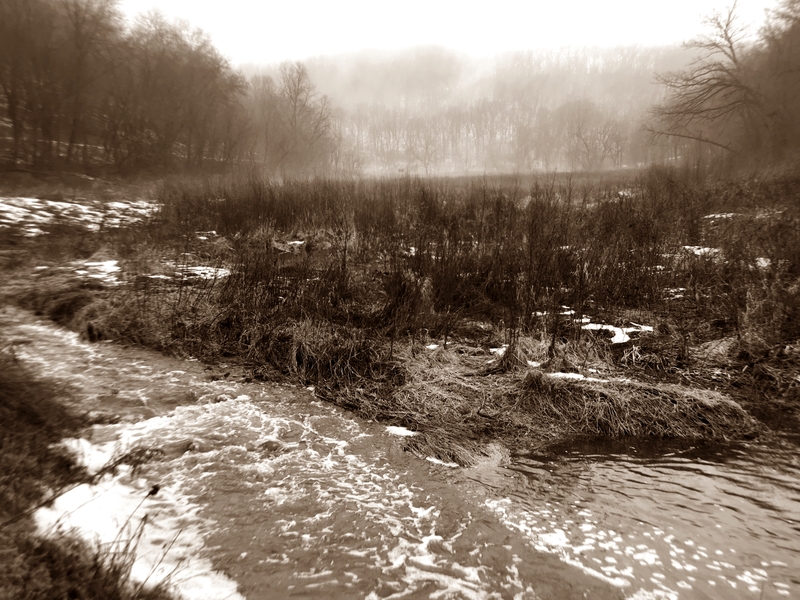 The springy headwaters were vast and created as much beauty as danger. 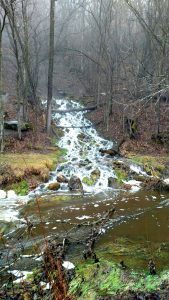 Spring water was trickling out of slopes everywhere. Sandy rocky bottoms with debris quickly gave way to silt and mire which was very dangerous. 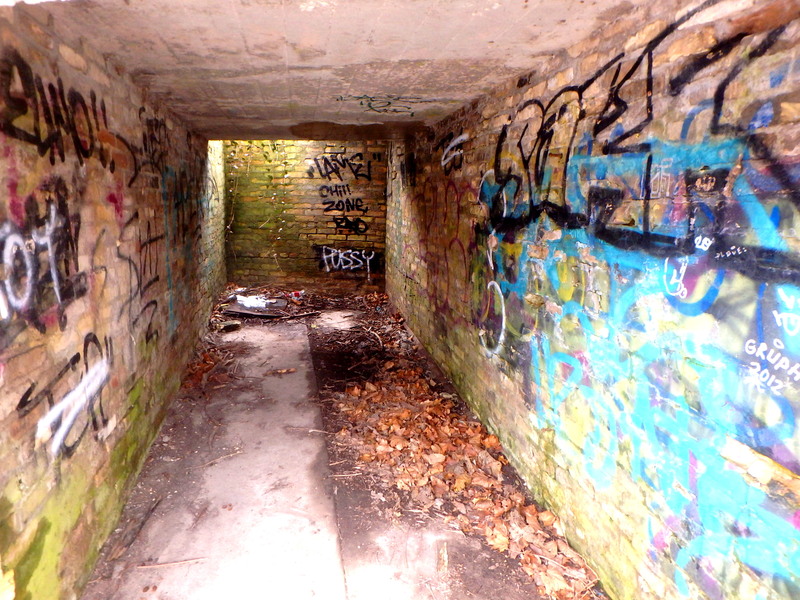 Not the place to be after a half mile hike from the road by yourself. I even found quicksand. 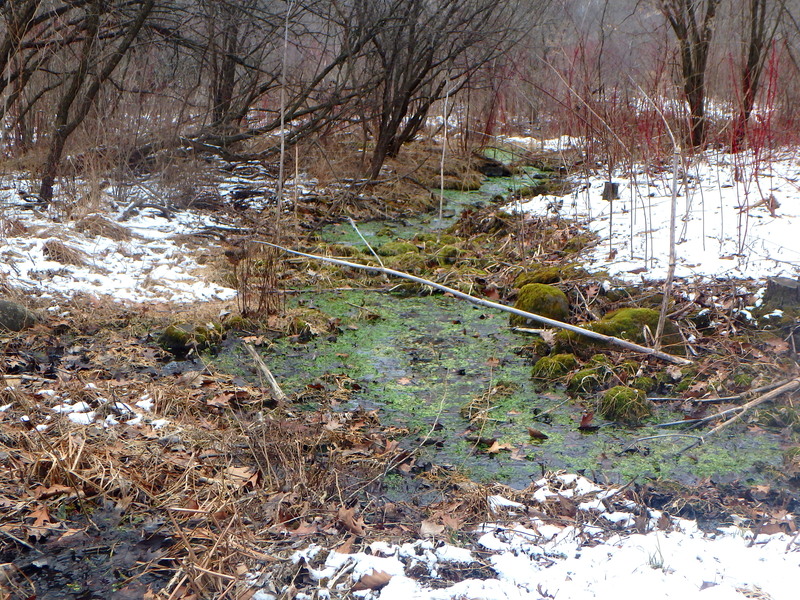 I also found spring water gushing through a sandy bottom at one of the many spring sources. Trying to cross this springy feeder was a bad idea. It tried to swallow me whole. 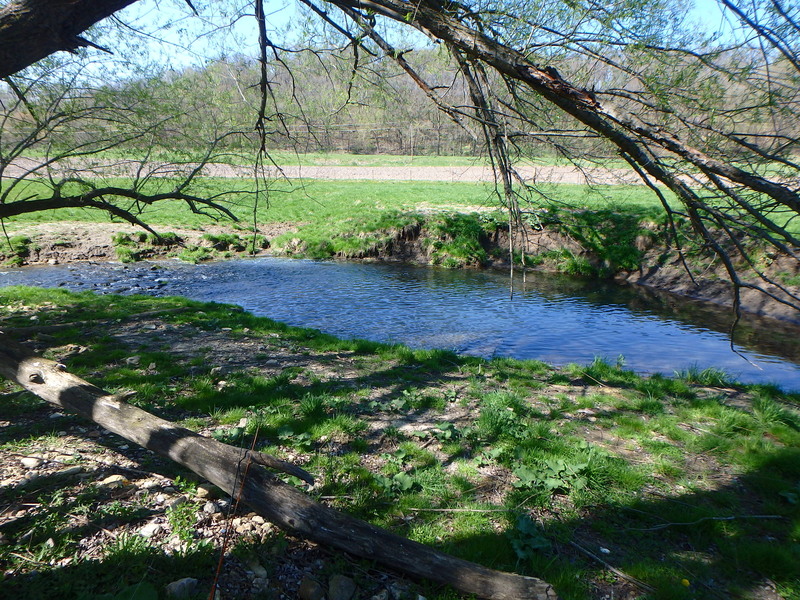 The stream would eventually trickle from the other side of the pond and create the stream. 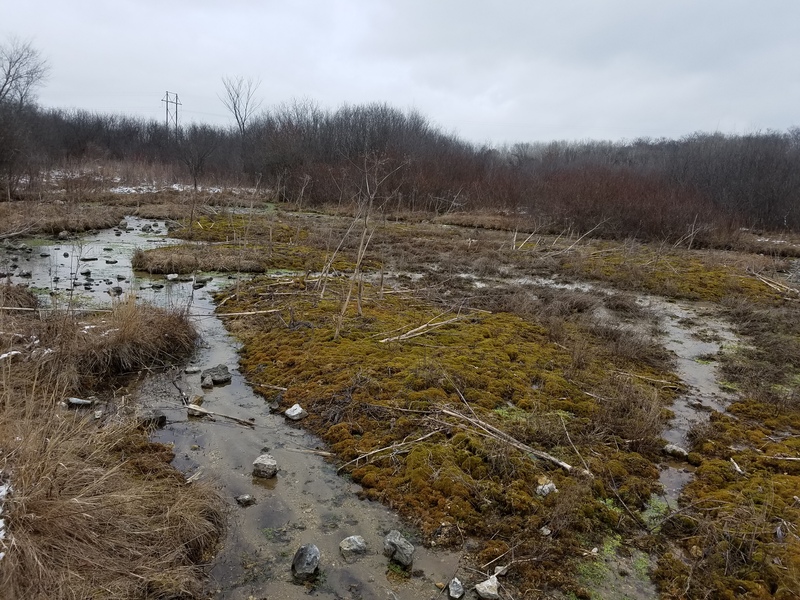 It was evident much rehab work was done here and I started seeing small browns. 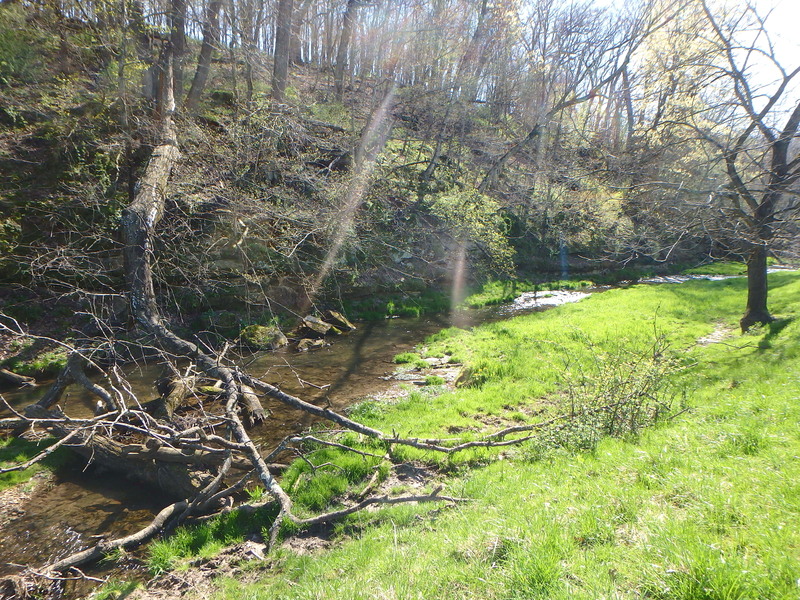 This creek was pretty small but had many small pockets with under cut banks in the 4 ft range. There was a bit of bush whacking involved and there were no big pools. 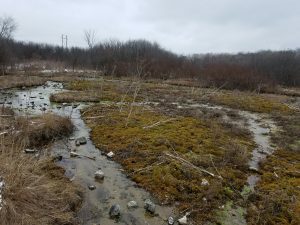 The problem here is the water quality far surpasses the actual habitat in terms of cover, holes, and structure. 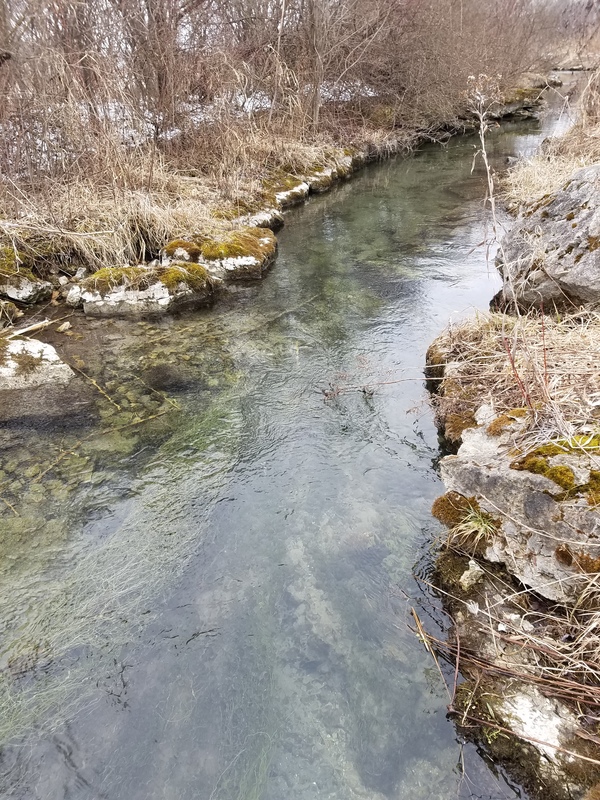 I think this would prove to be a fun technical dry fly creek in the Spring but I don’t see it making it into my fishing routine. 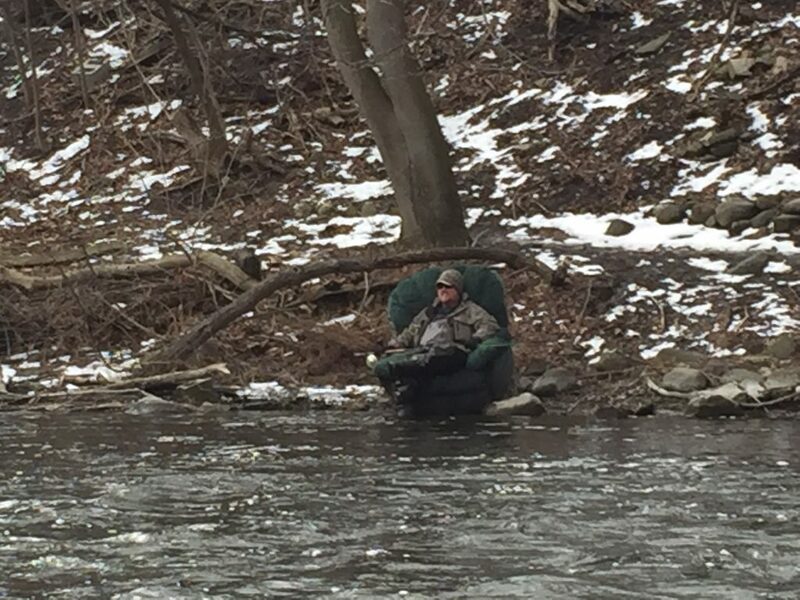 I’d rather drive an extra hour and be in much better trout habitat. 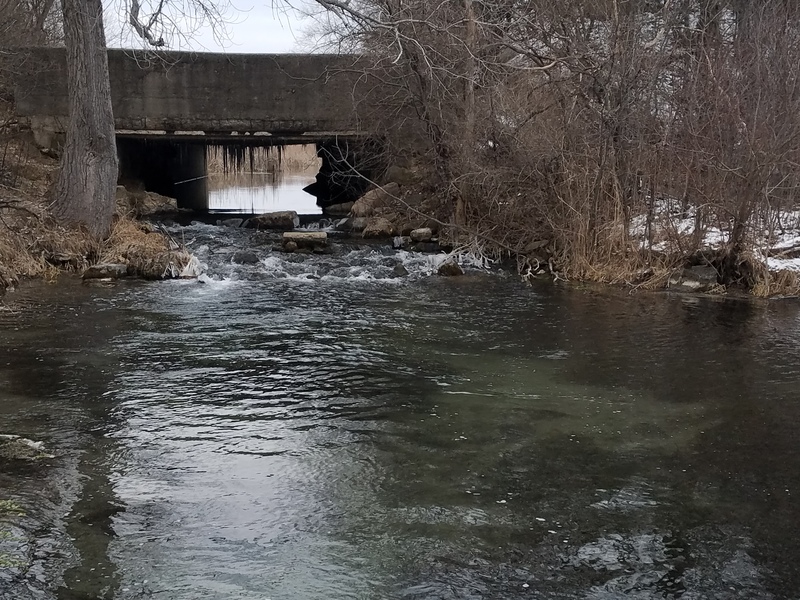 Not the Winter Blues option that I’d hoped for but refreshing to know there is cold flowing spring water an hour from home with signs of life. 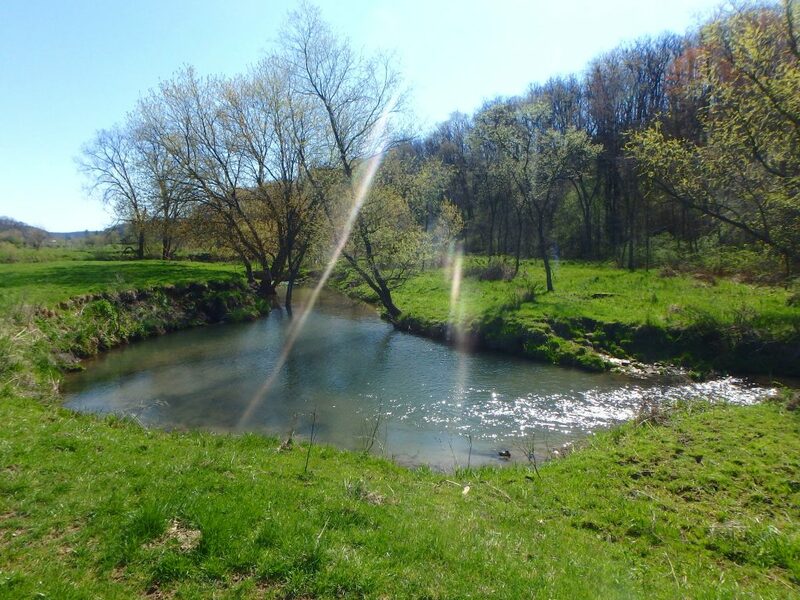 These guys put together a nice video about a special place for fly anglers close to Chicago. 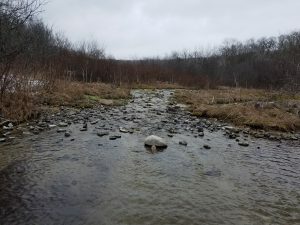 This river is undergoing a dam removal real soon that should overall improve the water quality, but it will definitely have a different personality as a free flowing river. Opening well over a hundred miles of river including tributaries could increase the chance/rate of natural reproduction in many species. 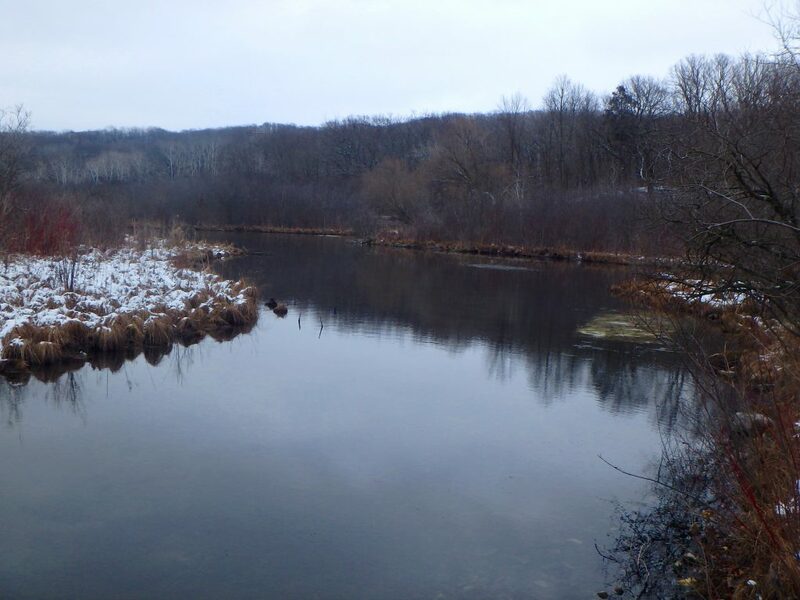 It will be sad to put this place off for a season or two while sediment from behind the dam redistributes itself throughout the river, but if it means we will have a wild and free flowing river I wont complain. 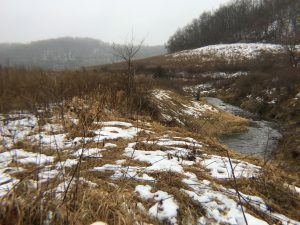 With the warmer than normal weather we experienced last weekend some friends and I got out for a day of trout fishing in the driftless area. 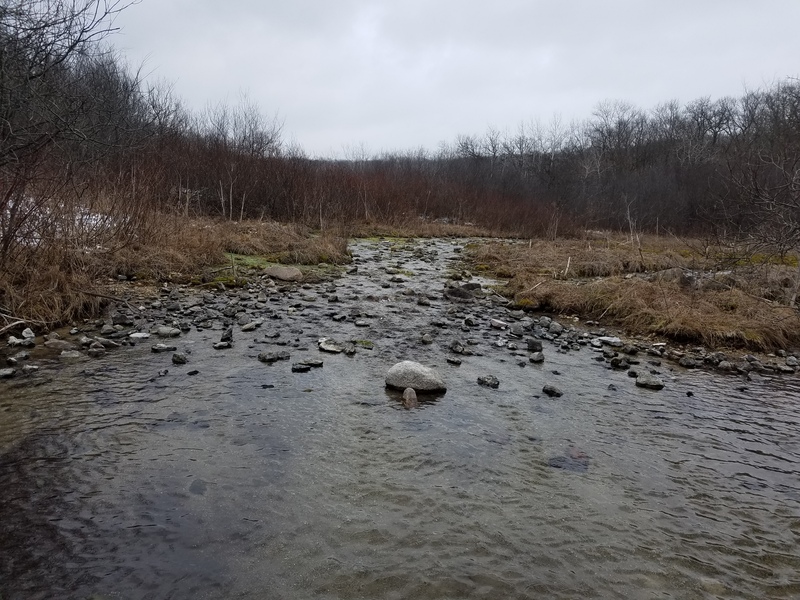 Due to some rain and snow melt we encountered some situations that we all learned from which in turn will make us more successful in the future. The first thing we came to notice was that the larger valleys did have more runoff muddying up the creeks and dropping water temps. Even when we traveled upstream toward the headwaters. 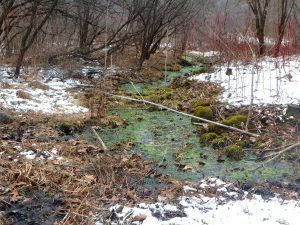 We found the best water conditions in smaller drainages or creeks that flow from small reservoirs. The second thing we noticed was that the larger flies we tried didn’t get as much attention as small nymphs. We even saw a dozen rises throughout the day, and a fair number a midges fluttering around. 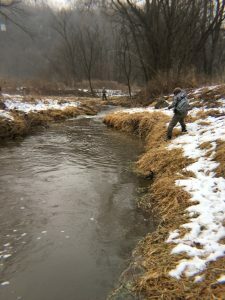 On one particular creek where the visibility was maybe only a couple inches I caught several fish on a size 18 stonefly nymph. Most of us started the day with leeches and woolly buggers, but one by one we started switching to nymphs as we watched each others success. Given the circumstances we did pretty good. 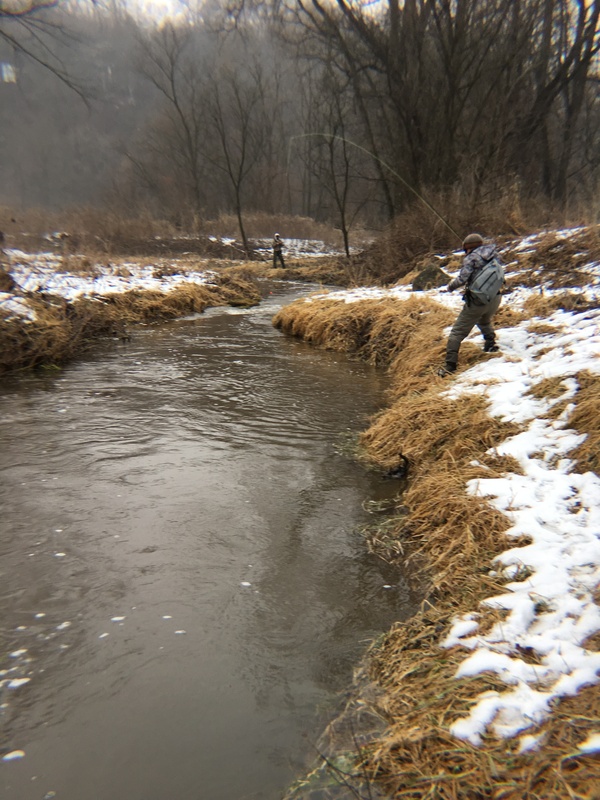 Catching trout on a foggy stream with some friends is a great way to spend a January afternoon.